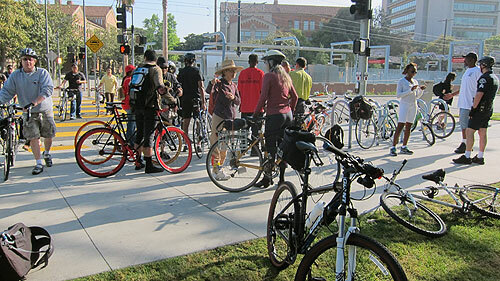 This morning a group of 50+ cyclists from throughout L.A. participated in the “Expo/Mid-City Ride” as part of Bike Week L.A, a weeklong celebration of bicycling for work, school and other destinations throughout L.A. County. 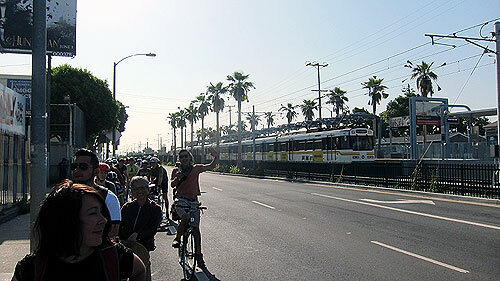 The group ride followed fresh new bike lanes that parallel the recently opened Expo Line between Exposition Park and Culver City, and passed major destinations along the way, including University of Southern California, Jesse Brewer, Jr. Park, Rancho Cienega Sports Complex and Ballona Creek Bike Path. The ride, organized by Metro and LADOT, was intended to help introduce new and seasoned bicyclists to the nearly six miles of new bicycle lanes now part of L.A.’s rapidly expanding bikeway network. Dan Dabek, executive director of C.I.C.L.E, served as ride leader. 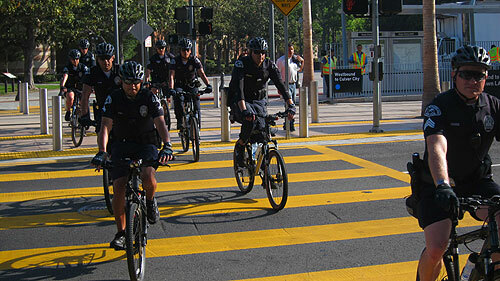 Members of the LAPD’s Bicycle Unit also joined the ride to provide ride support, although they did not cork intersections. 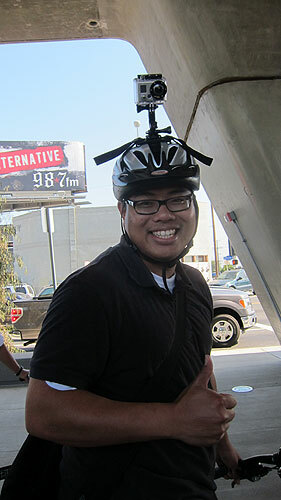 The group obeyed traffic signals along the 10-mile round-trip ride. The first phase of Expo features on-street bike lanes, officially qualifying it as a multi-modal transit corridor. The second phase, set to open in late 2015 or 2016, will feature mostly off-street bike paths similar to the Metro Orange Line in the San Fernando Valley. When asked how many cyclists had yet been on the Expo bike lanes near the Ballona Creek Bike Path, only three people raised their hands. That means more and more L.A. cyclists will be exposed to the possibilities of connecting with the Expo Line and then riding the creek path to Marina Del Rey and the beach this summer. 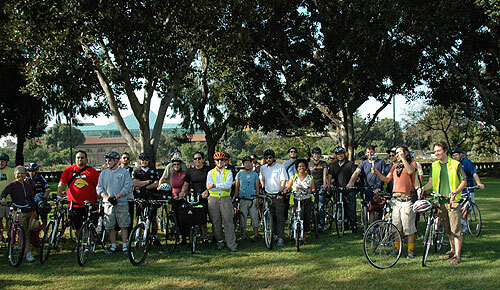 Cyclists congregate at Exposition Park in front of Expo Park/USC Station. LAPD's Bicycle Unit joins the ride. Cyclists stop at a red light and watch Expo train pass at elevated station. 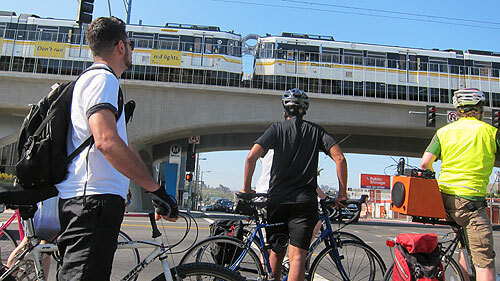 Expo Line meets cyclists heading westbound on Exposition Boulevard. 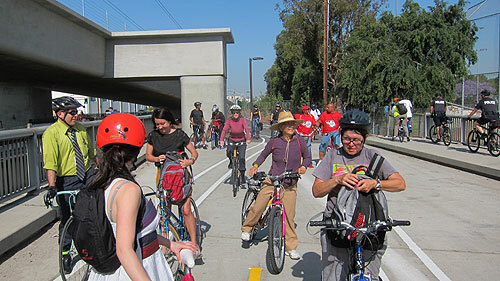 Cyclists stop for a breather at the portion of the bikeway that connects with the Ballona Creek Bike Path. Cyclist gives the thumbs up. 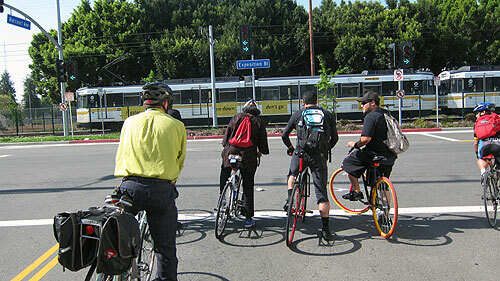 Riders wait out the traffic light at the intersection of Exposition Boulevard and Harcourt Avenue as Expo Line crosses.